I've already seen all the touristy sights. What's something different/unique/off the beaten path that I can do? What should I do with my teenagers/children? Up until recently, I've responded with some fairly standard answers about the catacombs, sewers of Paris and Pari-Roller's weekly Friday night get-together to rollerblade through the streets of the city. Now, thanks to Mon Beau Paris, I have a new response. 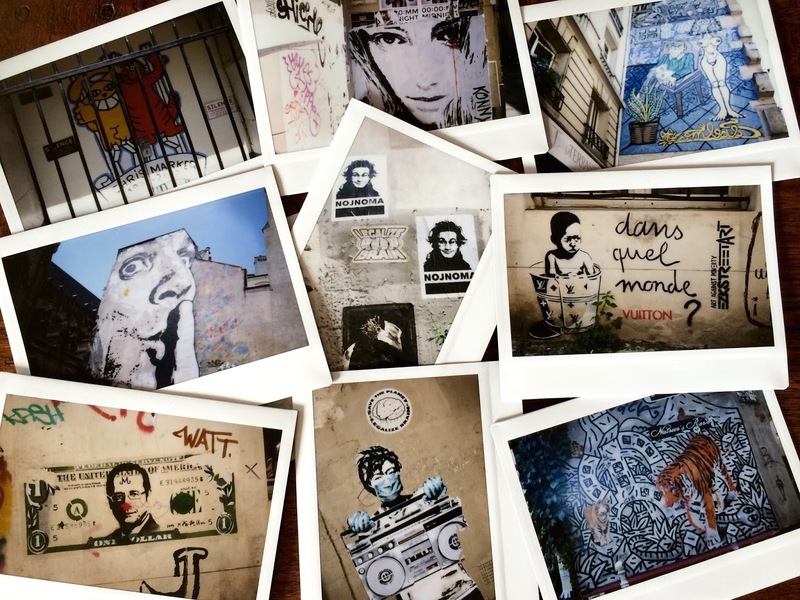 Try Le Marais Street Art Polaroid Tour! While Mon Beau Paris isn't the first company to offer street art tours of the French capital, what I found intriguing when they invited me to join one of their tours is that Mon Beau Paris provides their guests with Polaroid cameras to immortalize their favorite street art on film. reminder to listen to the sounds around you. "This tour is never the same," explained our guide, "because street art is constantly changing." While Aurélie, who is an official licensed guide with a background in art history, told us about the history of street art and defined some important terms, like graffiti and tagging, other members of the Mon Beau Paris team distributed Polaroid cameras and much appreciated bottles of water to quench our thirst on a hot Parisian day. Strolling along the familiar streets of the Marais, I found myself looking up, down and all around as Aurélie taught us to distinguish between works by Jef Aérosol, Le Diamantaire and M. Chat. The neighborhood took on a new dimension as we scanned the walls for stickers or words. 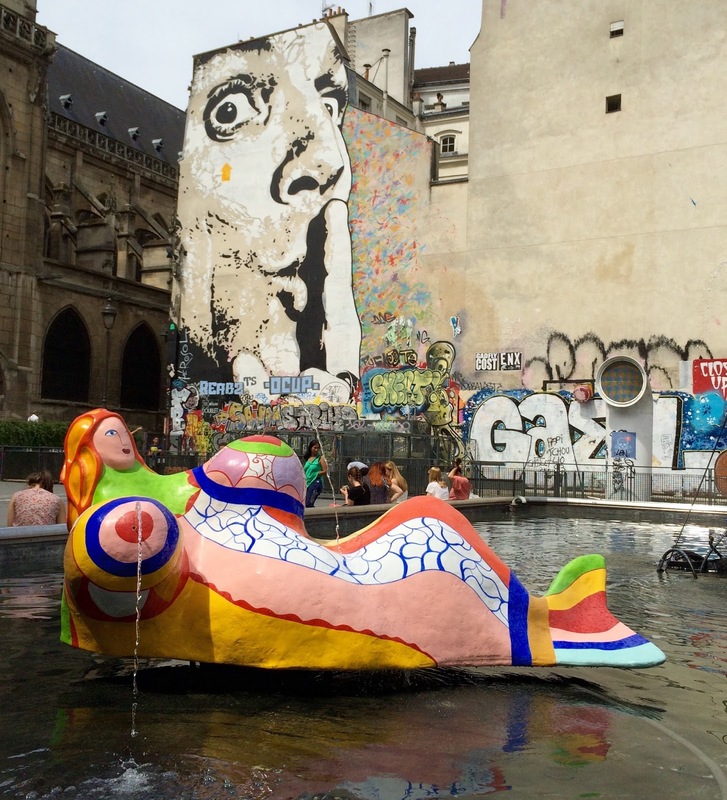 While some artists use urban spaces to provoke thought or make statements about socially relevant themes, others view street art as a way to share their creations freely with the world. The Polaroid cameras are a brilliant addition to the tour because they provide an innovative way for visitors to interact with street art and create entirely new pieces of art. I'm so pleased with my Polaroid photos that I'm planning to make a framed collage with them. It will be a uniquely different souvenir of a fun afternoon in Paris. Mon Beau Paris currently has a 5/5 rating on Trip Advisor. Tip: After juggling two cameras and my iPhone during the tour, I would suggest leaving your regular camera at home. If you want to take digital photos of the street art, you can always retrace your steps at a later time. Be sure to wear comfortable shoes and clothing. That is a very cool idea - a way to wander with a purpose! Great idea, esp. for teens. I did the Paris Walks in Le Marais and really enjoyed it, too. The street art in Paris is so much fun. I would never get tired of documenting it. I was very impressed and highly recommend them.